Home > Heavy Duty V Belts > V-Belts. A, B, and C Sections. Standard and Kelvar Construction > Classical B Section 21/32 inch (.66") Wide. Classical V-Belts. > BX30 Consumer Brand V-Belt. > BX30 COGGED V-BELT, INDUSTRIAL GRADE > Classical B29 Industrial V-Belt > BX29 V-Belt. COGGED BX29 Industrial V-Belt. BX29 V-Belt. COGGED BX29 Industrial V-Belt. BX29 Industrial Grade V-Belt. 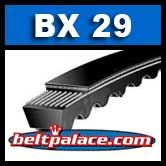 MOLDED NOTCH BX29 Industrial V-Belt, 21/32” (5/8”) Wide x 32” Length OC (16mm W x 813mm L OC). Features bias cut, insulated ultra-high strength polyester cords, superior compression section for high temperature and load carrying performance. Heat and oil resistant. High quality for low cost! NAPA, Grainger (low grade) BX-29. B29 BANDO Power King V-Belt. Classical B29 Industrial V-Belt. 21/32” (5/8”) Wide x 32” Length OC. Replaces Standard Raw Edge 5L320 FHP V-Belts.